Last edited by Josa on May 30th, 2018, 10:07 am, edited 1 time in total. Is it the same for you? The toggle is hardly visible in light mode. In dark mode I cannot easily tell if it is enabled or not. The toggle is added by Bug 1462468 - Add a tracking protection option to the hamburger menu. Fanolian wrote: Is it the same for you? The toggle is hardly visible in light mode. In dark mode I cannot easily tell if it is enabled or not. I commented that on the bug report for you. Mozilla shouldn't be making silly errors like this after all this time. When you do UI stuff on unknown backgrounds, you use a 'double ring' technique to ensure stuff is always visible. In this case, you take that white blob and put a 1px black outline around it. Anyway, I dislike such kind of "toggle switch". Does It show status of now? or status after change it? Alice0775 wrote: Anyway, I dislike such kind of "toggle switch". The toggle allows you to change the status of your current settings without opening Options/Preferences. 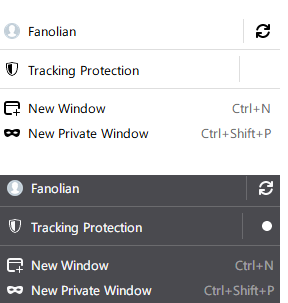 If enabled the toggle allows the user to disable tracking protection, if disabled the user can enable it. Can't see it in the Light or Default themes. Should be more visible, maybe green for enabled and red for disabled. Like the multi-select tab feature, but forgot I had enabled it and used my old method of closing all tabs today.